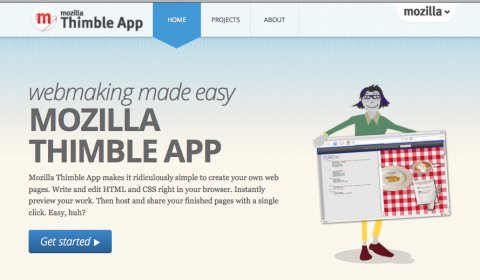 As you all might have known till now, Mozilla announced its new Webmaker initiative last week! Mozilla Webmaker is a project which is used to help people to make something creative, learn new things and play using the open web technologies. The goal: help millions of people move from using the web to making the web. With new tools to use, projects to create, and events to join, we want to help the world increase their understanding of the web and take greater control of their online lives. Watch this video about webmaker – they all share about what it means to teach the next generation of webmakers. The Summer Code Party kicks off on June 23rd, and is an open invitation to join us/Mozilla to meet up with friends/youth/anyone, make cool stuff, and learn how the code behind the web works. We have a several tools to help and support your events like Hackasaurus, Popcorn, Thimble. Thimble is an awesome new tool and basically is a web page editor combined with a series of 'projects' that help you learn the basics of HTML and CSS. Thimble is now under testing and will go live in a week. Hosting an event is very simple. Here is the sample guide on hosting a Kitchen Table event. The events have already started. Now don't wait, go search and RSVP an event which is near to your place and start hacking on the web! We have an exciting group of partners including Tumblr, Creative Commons and others. Here’s more about my experience betatesting that project.